From The Detroit News: A resolution introduced in Wayne County seeks to encourage state and federal legislators to regulate and limit ammunition sales. Outgoing District 6 Commissioner Reggie “Reg” Davis submitted the resolution to the commission’s chair, Gary Woronchak, to encourage Michigan and U.S. leaders to adopt policies to end gun violence. If the commission does that, Davis said, he plans to seek passage of an ordinance to adopt the policies for which his resolution calls. Davis spoke about his resolution before members of the media Tuesday morning at Woodlawn Cemetery in Detroit, where his brother and uncle, slain from gun violence, are entombed. Davis’ resolution would call for ammunition sales to require a background check, including a mental health evaluation. It also would encourage levying higher taxes on ammunition and limiting the number of bullets a person can buy. Davis said the resolution also would seek the ability for people to purchase ammunition at a law enforcement agency, where they could get a background check done, as well. He said he is not seeking to limit its purchase at stores or gun shows. Revenue made from bullet sales and taxes, Davis said, could go toward families of gun violence victims and educating people on gun safety and the Second Amendment. Davis also recently learned of a push in California to include serial numbers on bullets. He said he hopes to add an addendum to the resolution he is proposing that would call for a way to track bullets, though he expressed concern that using serial numbers for each bullet would be costly. Davis said he would like to see the resolution passed at the meeting of the 15-member board on Oct. 4 or the one after. He is hopeful for the resolution but is doubtful an ordinance could survive since it would likely face legal challenges. Earlier in his life, Davis said he had an “affinity” for guns, owning sniper rifles, double barrel sawed-off shotguns, Glocks, revolvers and more. That changed on Feb. 19, 2001, when his 19-year-old brother, Vito, died in a botched armed robbery. This entry was posted in Constitution, crime, Fear Mongers, gun control, Gun Control/2nd Amendment, Health Care, Liberals/Democrats/Left, NRA, Taxes, United States and tagged #2A, ammunition, ammunition purchase limits, ammunition purchases, ammunition serial numbers, ammunition tracking, Bullet Bill, Detroit, Detroit's gun violence, District 6 Commissioner Reggie Davis, Law Enforcement, mental health evaluations, Michigan, Reggie Davis, Wayne County, Wayne County Bullet Bill. Bookmark the permalink. They’re unable to control the mental stability of criminals so they lash out at our God given rights. To me, that makes THEM mentally unstable also. No, want-wit. It’s sub-Saharan Africa. All the gang members are in line already!! “… when his 19-year-old brother, Vito, died in a botched armed robbery”. Do he be the robber or do he be the robbee? We don’t need their permission. 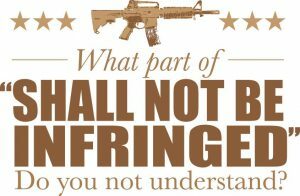 “…..Shall not be infringed”. Equating tools to actions is misleading. Of course they will claim ANYTHING to do their bosses’ bidding. If a group of thugs decides to beat kids to death with ball bats are they going to outlaw bats? I doubt it (unless you’re in London). NONE of this has ANYTHING to do with crime. People should STOP arguing with them……PERIOD. Do not get sucked into compromise arguments. All you can do is lose. Who needs bullets, when you have one of these? The Girandoni Air Rifle. That oughta make the criminals obey the law. While well intentioned by Commissioner Davis, gun control is planned by globalist NWO/UN forces to lead to control over all other areas of our lives.